They believe in their god, Bondyè. He is a distant god and does not meddle in human affairs. The practitioners of this religion are therefore directing their worship to the spirits that are servants of Bondyè; they are called loa. There’s a loa for every life aspect, and their personalities are quite dynamic and constantly changing. The Vodouists cultivate personal relationships with the voa to navigate their daily lives. They do so by taking part in differtent Voodoo Rituals, like presenting offerings to the loa, and they also create personal altars for them, and participate in dance and musical ceremonies and spirit possessions. The origin of this religion goes back to the 18th century and the French slave colony in Saint-Domingue. West African Vodun; The West Aftican Vodun, also called Vudun is a religion that is practiced in coastal West Africa (Togo to Nigeria). Their beliefs are centered around vodun spirits and other elements of divine essence. These elements and spirits govern the Earth, and they have a hierarchy. There are major deities; these deities govern over human society and forces of nature. The spirits can govern over rocks, trees, individual streams. 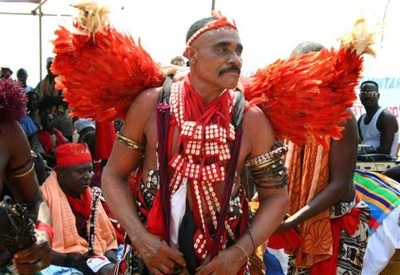 There are also ethnic vodun who protect clans, nations or tribes. 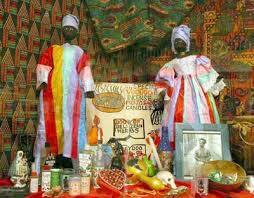 The Voodoo rituals are performed by women, usually described as queen mothers. These priestesses, as well as priests, are chosen by the oracle, and this can happen at any given moment during their lives. When they receive a calling, they start the spiritual instruction. The voodoo practices are different around the world. Often described as queen mother is the first daughter of a patriarchal lineage of a family collective. She holds the right to lead the ceremonies incumbent to the clan: marriages, baptisms and funerals. She is considered the one of the most important members of community. She will lead the women of a village when her family collective is the ruling one. Her dominant role has often been confused or associated to that of a high priestess which she is not. They take part in the organization and the running of markets and are also responsible for their upkeep, which is vitally important because marketplaces are the focal points for gatherings and social centers in their communities. In the past when the men of the villages would go to war, the Queen Mothers would lead prayer ceremonies in which all the women attended every morning to ensure the safe return of their menfolk. The High priestess is, on the other hand, the woman chosen by the oracle to care for the convent. Priestesses, like priests, receive a calling from an oracle, which may come at any moment during their lives. They will then join their clan's convent to pursue spiritual instruction. It is also an oracle that will designate the future high priest and high priestess among the new recruits, establishing an order of succession within the convent. Only blood relatives were allowed in the family convent; strangers are forbidden. In modern days, however, some of the rules have been changed, enabling non family members to enter what is described as the first circle of worship. Strangers are allowed to worship only the spirits of the standard pantheon. Vodun priests can be male (houngan or hungan), or female (mambo). A Vodun temple is called a hounfour (or humfort). At its center is a poteau-mitan a pole where the God and spirits communicate with the people. An altar will be elaborately decorated with candles, pictures of Christian saints, symbolic items related to the Loa, etc.